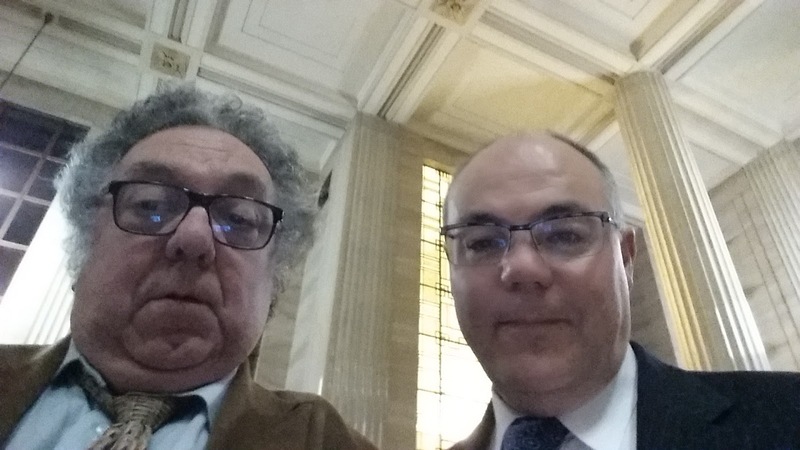 And by a remarkable coincidence that could only happen in Ottawa, I attended an event tonight in the lobby of the Supreme Court of Canada hosted by the Bora Laskin Society at which we heard inspiring, wise and witty stories from Justice Michael Moldaver with moderator Professor Adam Dodek. (101) CBC argues that, while the Board may fix the royalties to be paid under the statutory licensing procedure created by s. 70.2 of the Copyright Act, the Board may not set the other terms or structure of that licence. Specifically, CBC takes issue with the Board’s decision to impose an interim licence on a blanket basis, such that CBC pays for access to the entire SODRAC repertoire, rather than on CBC’s preferred transactional basis, whereby CBC would pay only whenever it actually used a work from the SODRAC repertoire. A blanket licence grants access to SODRAC’s entire repertoire for its duration, and thus reduces CBC’s ability to control its licensing costs. Under a transactional licence, by contrast, CBC may choose in any given situation whether it wishes to licence a particular work or forego making use of SODRAC music. CBC argues that if the collective organization and the user disagree over the model a licence is to take — blanket or transactional — the Board lacks the power to compel the execution of a licence. (102) SODRAC counters that the Board has the power to issue licences in either blanket or transactional form, and should have this power in all proceedings under s. 70.2. To hold otherwise, it argues, would be “to make the Board’s remedial jurisdiction under section 70.2 dependent upon the consent of a user, [and] would be at odds with its mandate to resolve disputes”: R.F., at para. 133. (103) Though CBC first raised this issue in the context of the Board’s Interim Licence Decision, the dispute relates generally to the Board’s power to structure licences, whether interim or not: Does the Board’s power to set the terms of a licence include the power to bind the parties to those terms? (104) I do not read the Copyright Act to necessitate that decisions made pursuant to the Board’s licence-setting proceedings under s. 70.2 have a binding effect against users. Section 70.2 itself provides that where a collective organization and a user cannot agree on the terms of a licence, either party may apply to the Board to “fix the royalties and their related terms and conditions”: Copyright Act, s. 70.2(1). This grant of power speaks of the Board’s authority to set down in writing a set of terms that, in its opinion, represent a fair deal to licence the use of the works at issue. It says nothing, however, about whether these terms are to be binding against the user. (106) This provision makes it clear that a user whose copying activities were the subject of a s. 70.2 proceeding may avail itself of the terms and conditions established by the Board as a way to gain authorization to engage in the activity contemplated in the Board proceeding. The language of s. 70.4 does not, of its own force, bind the user to the terms and conditions of the licence. (107) The conclusion that Board licences established pursuant to s. 70.2 are not binding on users comports with the more general legal principle that “no pecuniary burden can be imposed upon the subjects of this country, by whatever name it may be called, whether tax, due, rate or toll, except upon clear and distinct legal authority”: Gosling v. Veley (1850), 12 Q.B. 328, 116 E.R. 891, at p. 407, as approved and adopted in Ontario English Catholic Teachers’ Assn. v. Ontario (Attorney General), 2001 SCC 15,  1 S.C.R. 470, at para. 77, and Attorney-General v. Wilts United Dairies, Ltd. (1921), 37 T.L.R. 884 (C.A. ), at p. 885. To bind a user to a licence would be to make it liable according to its terms and conditions should it engage in the covered activity. In the absence of clear and distinct legal authority showing that this was Parliament’s intent, the burdens of a licence should not be imposed on a user who does not consent to be bound by its terms. (108) SODRAC’s framing of the issue is not entirely wrong: the Board does have the power under s. 70.2 to “fix the royalties and their related terms and conditions”. That is, the Board may decide upon a fair royalty to be paid should the user decide to engage in the activity at issue under the terms of a licence. However, this power does not contain within it the power to force these terms on a user who, having reviewed the terms, decided that engaging in licensed copying is not the way to proceed. Of course, should the user then engage in unauthorized copying regardless, it will remain liable for infringement. But it will not be liable as a licensee unless it affirmatively assumes the benefits and burdens of the licence. (109) The matter is complicated considerably by the fact that the Board’s statutory licence decisions have, in recent years, taken on an increasingly retroactive character. CBC’s statutory licence in this case provides an example: the licence covers the period from November 2008 to March 2012, but the Board’s final decision was issued on November 2, 2012, after the term of the licence had expired. In situations like these, the Board may issue interim licences that seek to fill the legal vacuum before the final decision is ready, but this leaves a user to operate based on assumptions about how their ultimate liability for actions taken during the interim period will be evaluated. (110) Should a user engage in copying activity under an interim licence, and then find itself presented with a final licence whose terms it would not voluntarily assume, the user is left in a difficult position: accept the terms of an undesirable licence, or decline the licence and retroactively delegitimize the covered activity engaged in during the interim period, risking an infringement suit. This dilemma may mean that a user who operates under an interim licence has no realistic choice but to assume the terms of the final licence. (111) While I find this possibility troubling, I do not find that this result would detract from the more general proposition that there is no legal basis on which to hold users to the terms of a licence without their assent. The licence is not de jure binding against users, even if the particulars of a specific proceeding, and a user’s decision to engage in covered activity during an interim period, may mean that the user does not de facto have a realistic choice to decline the licence. (112) I conclude that the statutory licensing scheme does not contemplate that licences fixed by the Board pursuant to s. 70.2 should have a mandatory binding effect against users. However, this case does not require this Court to decide whether the same is true of collective organizations. It may be that the statutory scheme’s focus on regulating the actions of collective organizations, and the case law’s focus on ensuring that such organizations do not devolve into “instruments of oppression and extortion” (Vigneux v. Canadian Performing Right Society Ltd.,  S.C.R. 348, at p. 356, per Duff J., quoting Hanfstaengl v. Empire Palace,  3 Ch. 109, at p. 128) would justify finding that the Board does have the power to bind collective organizations to a licence based on the user’s preferred model — transactional or blanket — on terms that the Board finds fair in view of that model. However, this issue was not argued in this case. The decision will appear here at 9:45 AM or shortly thereafter. Intellectual property law - Judicial review - Copyright - Licenses - Licensing societies - Royalties - Ephemeral copies - Application by broadcaster for review of licenses issued by Copyright Board allowed in part - Collective society imposing royalties on producers of content and broadcasters - Licences allow collective society to collect royalties for copies incidental to use of new broadcast technologies - Whether broadcast-incidental copies require a separate licence under a technologically-neutral interpretation of the Copyright Act, R.S.C. 1985, c. C-42 - If a licence is required in FCA File No. A-516-12, what is a technologically-neutral royalty rate for broadcast-incidental copies - Whether the Board err in law by granting an interim licence in FCA File No. A-63-13. Here is the link to all the factums. I filed a factum on behalf of the Centre for Intellectual Property Policy of McGill University (headed by Prof. David Lametti, now David Lametti, M.P.) and Prof. Ariel Katz of the University of Toronto, both of whom appeared with me at the hearing. A webcast of the hearing is available here. On Tuesday, November 24, 2015 at 10:00 a.m. in the Copyright Board's hearing room at 56 Sparks St. in Ottawa with the Board’s new Chair, the Copyright Board will hear the first contested retransmission tariff hearing in 20 years. To somewhat oversimplify, the collectives want $2.00 a month per subscriber increasing to $2.38 by 2018. The Broadcast Distribution Undertakings (i.e. “BDUs” or cable and satellite companies) want to continue at the current agreed upon amount of $0.98 per month decreasing to $0.90 by 2018. The retransmission tariff results from Copyright Act amendments made in 1988 so that Canada could enter into the then new FTA with the USA. Along with the abolition of compulsory licenses for generic drugs, this was a very major concession to the USA in the FTA process. Canada, unlike the USA, did not spell out a formula in the legislation for what was to be a distant signal and left the mechanics of it all to the then new Copyright Board. Distant signals were eventually defined by regulation in an ultra-complex manner potentially much more generous to copyright owners than the US mechanism. The Board’s first tariff in 1990, following an extremely long “inaugural” tariff hearing, was worth about $53 million p.a., an amount about 9 times more than anyone ever expected at the time – even including the proponents of the tariff. A rather tepid subsequent “criteria” regulation resulted in a very modest cutback of about $3 million a year in 1993. For twenty years, Canadian cable subscribers paid $0.70 per month that was included in their cable or satellite bill for access to “distant” signals. This amount was increased to $0.98 per month in 2013 and so certified by the Board pursuant to a negotiated agreement. Recently published estimates of the value of the tariff confirm that it is now worth more than $100 million p.a. While $0.98 or $2.00 per month would seem like a small amount compared to monthly cable charges that can range from about $40 to about $119 per month, for example, in the case of Rogers, it quickly adds up to a lot of money for the major parties concerned. To what extent this cost is passed on to consumers and to what extent it may contribute to “churn” or cord cutting are probably very interesting questions that may be addressed in this hearing. An interesting aspect of the change in environment that does not seem to arise on a quick scan of the parties’ cases is that of the issue of vertical integration in the BDU industries. Certain BDUs are now major content owners. How does this affect the positions that they take at the Copyright Board and at the CRTC? The economics of cable costs and the willingness of consumers to pay the cable pipers may be about to change, with the increasing rates of “cord cutting” and reliance on over the air digital signals, Netflix, and other means of access to programming. These issues may arise to some extent during this hearing - though it should be noted that this hearing is about 2014 – 2018 and we are almost half way through the period covered by the proposed tariff. In the long run, however, if the “cord cutting” and other trends continue, this could be another example of a tariff that will become obsolete sooner or later, along with the private copying levy, reprography, media monitoring. Meanwhile, it seems to be worth everyone’s effort to invest in a large and no doubt expensive cast of lawyers and experts, including some of the “usual” suspects in terms of expert witnesses. It will be especially interesting to see to what extent the Board deals with such issues as cord cutting, the recent “pick and pay” ruling by the CRTC. In this regard, it will be interesting to see whether the Board assumes a more than usual “inquisitorial” role by asking its own questions and relying on its own research to some extent rather than relying solely on the parties. This may be one of the most complicated, arcane and least exciting or readily understandable tariff issues that have faced the Board in recent years – but for the time being could be the most economically significant hearing to date. This seems to be the single most lucrative tariff under the Copyright Board’s jurisdiction. Although it looked for a time as if private copying or “reprography” might eventually rival the retransmission tariff, both of these tariffs are headed towards potential oblivion in the absence of some dramatic reversal of fate. This, too, could happen someday to retransmission – but not likely this time around unless the Board decides to say “a pox on both your houses”. It is also the occasion that is expected to mark the debut of the Board’s new Chair, Justice Mr. Justice Robert A. Blair of the Ontario Court of Appeal. Blacklock's Law Suits Update - Is this a "Litany" of Litigation? Here’s an update on the Blacklock’s litigation. The Canadian Vintners Association (“CVA”) has decided not to appeal the Small Claims Court judgment in 1395804 Ontario Limited (Blacklock’s Reporter) v Canadian Vintners Association (“CVA”), 2015 CanLII 65885 (ON SCSM) that has received so much attention, despite the fact that it has no precedential value and has been fundamentally called into question by Teresa Scassa, Michael Geist and myself and perhaps others. Although I can only speculate, the CVA’s decision is presumably based upon a careful cost/benefit analysis. It is an organization serving the interests of Canadian wine makers – and copyright law is obviously not its core concern. The cost of appeal in relation to the damages award would presumably be significant and likely not fully recoverable – even in the event of success. The CVA had able counsel – and I’m sure that the decision was made very carefully. I understand that there are no other Blacklock’s cases in the pipeline at the Ottawa Small Claims Court at this time. So, attention shifts back to the Federal Court, where there are now no less than ten Blacklock’s cases pending against the Federal Government or its agencies. The Feds have asked to stay all but the first of these actions and to proceed promptly on that one, which will presumably benefit from adequate discovery, presumably be based upon a similar set of facts as the others, and presumably could serve as a “test case” in this instance. Here’s the Federal Government’s submissions of November 2, 2015. Here’s the response by Blacklock’s counsel dated November 5, 2015. Here’s the Federal Government Reply dated November 9, 2015. I will keep readers posted. Meanwhile, if anyone hears of any other Blacklock’s litigation, please let me know. Here’s Blacklock’s activity to date in the Federal Court, in indicating 13 copyright infringement actions since June of 2014. 1 Christian Church. A series of supplications, deprecations, or intercessions in which the clergy lead and other people respond, the same formula of response usu. being repeated for several successive clauses (used either as part of a service or by itself, in the latter case often in procession). ME. 2 transf. A form of supplication (e.g. in non-Christian worship) resembling a litany; a continuous repetition or long enumeration, a repeated formula, a long series. LME. Here’s the important study from New Zealand (recently mentioned by Michael Geist in his “must view” CIGIOnline talk) entitled Economic Modelling on Estimated Effect of Copyright Term Extension on New Zealand Economy. The study was commissioned in 2009. Based on this research, the Government estimated that the average cost to New Zealand from the obligation under TPP to extend New Zealand’s copyright period from 50 to 70 years would average around $55 million per year. NZ GDP = ~ 10.4% of CDN GDP based upon World Bank figures for 2014. The average present value of the cost of 20 year copyright for recorded music and books term extension (which included an estimate for film and television) was estimated by NZ is NZ $505 million, which is CDN $434 million, which adjusted by GDP ratio, would work out to about CDN $4.176 billion. The average annual cost for NZ is NZ $55 million, which is $CDN 47.3, which adjusted by GDP ratio, would work out to about CDN $454 million. I look forward to reading the whole study in detail. If Canada has anything comparable and credible by way of independent analysis, it would be useful to know. If not, it would useful to know why not. It has been too long since Canada based its copyright policy on actual evidence, such as we saw in the Consumer and Corporate Affairs studies in the early 1980’s, or the Economic Council, Ilsley, and Parker Commissions during the decades before. Canada needs to look at the costs of copyright term extension very carefully before we decide to sign on to the TPP - or to insist that certain aspects of it be renegotiated. Given that Canada has a new Government, that the current TPP deal was agreed to by a "caretaker" government during an election, and that acceptance of the TPP is anything but assured in the USA, anything is possible. TekSavvy’s Appeal to Get $346,480.68 for Taking the Position to Take “No Position” - "Nice Work If You Can Get It"? Here’s an update to my April 3, 2015 posting on TekSavvy's claim to entitlement to full indemnity costs, including legal fees, for a total of $346,480.68 for "for the costs it says it incurred as a result of Voltage’s motion" for disclosure and, which included $178,820.98 for legal costs, essentially for taking the position that it took no position in Voltage’s attempt to get the personal information on 2,000 or so of Teksavvy’s customers in order to pursue them for alleged copyright infringement. It will be recalled that the March 17, 2015 decision by now retired Prothonotary Roza Aronovitch of the Federal Court regarding TekSavvy’s costs motion resulted in TekSavvy getting only $21,557.50 – about 6% of what it asked for overall. And of that, only $4,500 was for legal costs, which were sought in the amount of $178,820.98. That’s 2.5% of what was asked for in legal costs. Both Voltage and TekSavvy have appealed Prothonotary Aronovitch's ruling. Here’s the docket. The appeal will be heard by Justice Peter Annis of the Federal Court on Monday, November 9, 2015 on the seventh floor at 90 Sparks Street, corner of Metcalfe in Ottawa. Both sides have filed voluminous material. Teksavvy has filed a 248 page “compendium” with excerpts from 19 cases. Teksavvy has also gone to great length in its very unusual attempt to file, as “new evidence”, the transcripts from the hearings before Prothonotaries Aalto and Aronovitch. Although CIPPIC is no longer actively involved on the file, the appeal material was eventually posted here by CIPPIC late last week and this will be helpful to the public discussion generally and to law students in particular. It will be recalled that CIPPIC stepped in earlier as an intervener, after Teksavvy took the position that it took no position, and sought adjournments so that CIPPIC could enter the fray. CIPPIC’s role was never entirely clear. It explicitly disclaimed any role in acting for Teksavvy or for the John or Jane Does. It did conduct some cross- examination and referred to the “hearsay” issue – the giant elephant in the room – in its written material in the disclosure motion but did not do so explicitly even once in its oral submissions before Prothonotary Aalto as confirmed by the transcript Teksavvy is trying to file. This may somewhat explain why Prothonotary Aalto’s decision does not once mention the word “hearsay”. According to the transcript of the substantive hearing before Prothonotary Aalto, CIPPIC was apparently more concerned with broad “public policy” issues than with the more practical question of whether, in light of the BMG decision, there was arguably insufficient substantial, admissible, non-hearsay, and reliable evidence to justify denial of the disclosure motion and thereby stopping the case from even moving forward. If only Teksavvy or CIPPIC had dealt with the evidence issue head on, this case arguably might never have gotten off the ground. For whatever reason, neither of them did so. While outcomes based upon evidentiary or procedural issues are not as dramatic or satisfying as policy based victories, there is a school of thought that one should take one’s victories wherever one can find them. In this case, if a ruling based upon insufficiency of adequate evidence could have been obtained, it might well have solved, at least for practical purposes and perhaps for a long time to come, a very big public policy problem – namely whether Canadian courts will have to deal with lawsuits such as we have seen in the USA and UK that could involve use of the courts for the alleged purpose of “speculative invoicing”, sometimes called “trolling”, of thousands of individuals who will have no practical recourse to defend their privacy and who, in very many cases, may very well be legally innocent of any infringement. In contrast to Teksavvy’s “no position” position (it did not even file any material at the disclosure hearing before Prothonotary Aalto), many may wonder why Teksavvy has devoted such extraordinary efforts to recover almost $180,000 in legal costs from Voltage - essentially for “taking no position” and asking for adjournments so that CIPPIC, a law school clinic could intervene. And now, including Monday’s appeal, there will be two lengthy costs related proceedings with an attempt to introduce new evidence, cross-examinations, and volumes of paper – all about legal costs and TekSavvy’s alleged other internal costs. If Teksavvy had only instead devoted perhaps just a fraction of these efforts and resources to attempting to knock Voltage’s case out of the park on the basis of inadequate evidence, and had this succeeded, as it seemed arguably very possible at the time, and as CIPPIC and others did in the 2004 BMG case (I was outside counsel for CIPPIC at the time and Shaw and Telus vigorously fought for their customers), Teksavvy might well have recovered substantial costs and its subscribers, whose privacy may now get compromised, would be much happier. But for reasons which remain, in my view, unexplained in any satisfactory way, this was not to be the case. One thing that should be clear and was clear to CIPPIC, Shaw and Telus, at least in 2004, is that defending privacy – including challenging the sufficiency of the copyright owners’ evidence - does not in any way condone piracy. It is the job of ISPs to defend their customers’ privacy – not the job of a law school clinic where the path is well worn and the ISP, for whatever reason, just won’t do its job. Voltage and TekSavvy made much of their cooperation in notifying the 2,000 or so customers of what was about to befall them – without giving Voltage their identities in that notification effort. But it was absurd to expect any of them to appear – even anonymously - on the disclosure motion to fight for their privacy. Most of them would have expected their ISP to do that, as Shaw and Telus did so well in 2004. (At that time, Rogers and Bell basically just observed and Videotron was on the side of the record companies). Nobody stood up here explicitly for Teksavvy’s customers. The clear position of the Federal Court of Appeal on the need for a copyright claimant to provide timely, reliable and adequate non-hearsay evidence, upholding Justice von Finckenstein’s decision below in this respect, has been eroded because it was neglected by Teksavvy, which took no position, and arguably not fully pursued by CIPPIC, which did not mention it at the hearing. Whatever one may think of Voltage, its agenda and its goals are at least very clear in this case. The same cannot be said of Teksavvy, or perhaps even of CIPPIC, which was placed in an awkward position and which had limited resources. It’s not at all clear that Justice Mandamin’s early expression in this case of how it was “important to get it right” and that a “motion without representations from different points of view does not help” has been fully met in this instance. Here is Justice Mandamin's Order of January 31, 2013. If this case goes further and Voltage eventually gets the names and addresses of its 2,000 or so potential defendants (or, at least, recipients of demand letters), just who is going to stand up for the customers’ interests in terms of wording of the letter and supervision by the Court, which Prothonotary Aalto clearly recognized as important issues in his decision? This should not fall to a subsidized law clinic because a presumably prosperous ISP with $5-$10 million a month in estimated cash flow chooses, for whatever reasons, to “take no position”. So, even though this case was started on November 14, 2012 – almost exactly three years ago – at this point we have far more questions than answers.